I hope you and your Cotons are enjoying the Fall season. Even though I live in Florida now and don't get to see the leaves change anymore, it's still one of my favorite times of the year. Unfortunately, this season may bring challenges for some dogs. Fall can mean allergies for many humans and dogs. Luc has had severe allergies since he was 2 years old (he just turned 7). I thought I'd share some of the things that have helped him since allergies are becoming a common problem for many pets. Of course, what works for one dog may not work for another so you really have to do a lot of experimenting to find the best treatments for allergy symptoms. Luc's symptoms came on fast and strong - he was itching and licking so much that he developed infections. He was miserable. The vet put him on steroids and this controlled the symptoms. Unfortunately, when the steroids wore off, his symptoms came back. It's not advisable to be on steroids long term so we went to an allergy specialist and went through a two year period where I had to give Luc weekly allergy shots. This was not fun for Luc or me, and the worst part is that the shots didn't seem to help. He gets weekly baths during allergy season. This is a must during months when he's most susceptible like October. I use Earthbath All Natural Hypo-Allergenic and Fragrance-Free Grooming Wipes on his paws every time he comes in the house from outdoors since he's allergic to grass and pollen. A food elimination diet helped me determine that he's allergic to chicken, turkey, and peanut butter. This was disturbing to me since I often put his allergy pills in turkey or peanut butter so he'd swallow them. Vets told me that his allergies were only environmental so we didn't do a food elimination diet until years after his symptoms started. This should have been the first thing we did - he would have had relief much sooner. After years of lotions, potions, pills, and shots - I was very open to a vet's suggestions to try a more organic holistic treatment approach. Luc has been using External Wind herbs every day for the past 6 months and it seems to be very safe and effective. A vet can help you with the right dosage. Regular ear cleaning. Floppy ear dogs like the Coton can be prone to ear infections and dogs with allergies almost certainly have ear problems, so regular cleaning is very important. You can find a good ear cleaner at any pet store or your vet can prescribe one. I find that happytails Canine Spa Line Ear Wipes are the best solution to use on a regular basis because Luc likes it much better than the liquid cleaner which usually ends up more on his coat than in his ears, as he shakes and rolls the cleaner out of his ears. I have to make sure that everyone who knows Luc knows not to give him any treats that I don't approve of. That includes the groomer, the dog walker, friends, relatives, and neighbors. One dog bone with peanut butter or chicken can bring on his symptoms. I make sure to keep carrots and Gentle Snackers HypoAllergenic Treats always on hand. My best advice is that if you don't find a vet or treatment that works at first; don't give up! It took a lot of patience and we went through several vets, but Luc's allergies are finally manageable. He still has occasional flareups, but now I know how to handle them. It feels great knowing my little guy isn't suffering anymore. You can find more details about what causes allergies and various preventions and treatments at these links. As always, please share your success stories with us as well. I hear from many of you who are going through this frustrating battle, and although there isn't just one solution to this complicated problem, it's always helpful to hear how others have found success. One of the most common causes of allergies is fleas. Depending on where you live, fleas may be a particular concern and figuring out the right flea prevention can also mean experimenting with different treatments. We've had some recent interesting discussion on our website about this topic. You can join the discussion here. 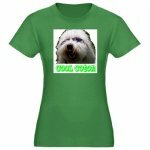 One of our special Coton friends, Spanky, was recently celebrated as dog of the month (see below), and it got me thinking that it would be fun to share all of our Coton celebrations with each other every month. 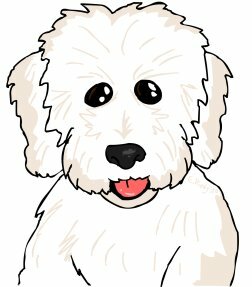 If you'd like your Coton to receive recognition in next month's newsletter, contact me on my contact page, or at Gale@coton-de-tulear-care.com. This month we're happy to celebrate Spanky's "dog of the month" recognition. You can check it out here. Way to go Spanky! Or you can stop by our website and congratulate Spanky here. And of course, we still want to celebrate our Coton birthdays. I missed a newsletter last month so we've got 2 months of birthdays to celebrate.